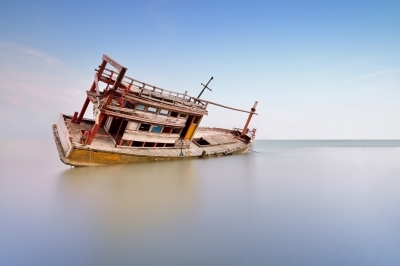 When things begin to go bad in your business, do you start to feel your ship sinking? If so, here is a statement to ponder. ”Ships don’t sink because of the water around them; ships sink because of the water that gets in them”. If you allow your current circumstances to get in your head and thoughts, the weight will drag you down. Your attitude about your situation is the most important aspect to keep your ship from sinking. We must all heed to the Law of Attraction. Our thoughts and our attitudes is where we feel our ship sinking, not our current circumstances. How we feel about the situation and how we react to the situation determines whether or not we float or sink. Take the story of Nick Stizman, who was a part time railroad worker. Nick was a large bull of a man. He was married with two children. Nick had one big issue, he was a worrier. He was always worried about something bad happening to himself or his family. One mid-summer day Nick was working on a refrigerated box car in the rail yard. When Nick finished his work, he realized he was locked in the freezer car and no one knew he was there. He began to beat on the doors screaming for help until his voice was completely hoarse. He had beaten the door with his fists until they were bruised and bloody. He began to realize his worst fears, he was going to die in this freezer. He began to cut a message into the wooden floor as his dying declaration. He even mentioned that his hands were so cold that he could no longer write in the wooden floor. He knew he was going to die there. The next morning when his fellow workers came in and opened the box car, there they found Nick dead on the floor. It appeared he had frozen to death which an autopsy later confirmed. The strange part of the story is the box car was only 55 degrees when they found him. It was determined the box car temperature never dropped below 50 degrees. However, Nick’s own thoughts were so powerful he truly believed he was freezing to death and did die from hyperthermia. Nick’s powerful thoughts and years of worry had manifest itself into his own death. It was not the water on the outside that made Nick sink, but rather the water on the inside. His thoughts and feelings versus his true circumstances. If you feel your ship sinking, don’t let the water inside, keep it outside where your ship will continue to float.